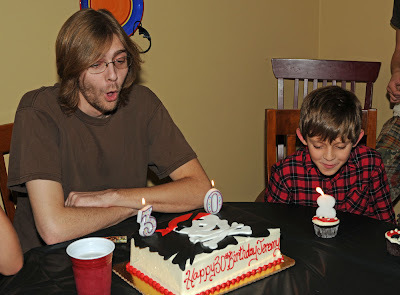 …for today my son turns thirty. There are times in my life where the hands on the clock don’t seem to move quickly enough; like during the work week when it seems like Friday will never come. Then there are times, decades in fact, which seem to pass in the blink of an eye. Thirty years ago today I found myself in labor with my first child; I was only seventeen. You can read about it here if you’re so inclined. I won’t be seeing him today as he’s going to visit his girlfriend’s grandfather who shares the same birth date, as does my grandson. It’s okay though because I saw him just over a week ago, along with about 50 others, when I surprised him with a party…and oh what a party it was. 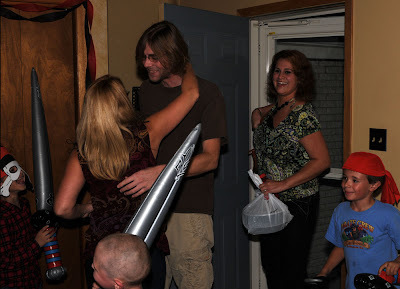 The hardest part about planning a surprise party is getting the guest of honor to show up and have them, well, surprised. 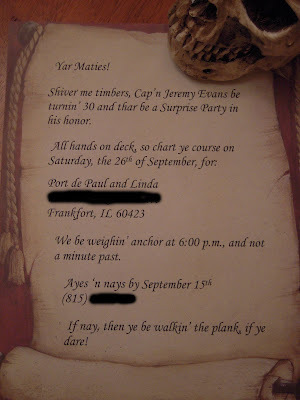 It ended up being quite easy with my son as I simply told him I was throwing a surprise 50th anniversary party for my parents and then followed it up by sending an invitation to him. When he came by for dinner a couple of weeks before the party I had a poster board on the dining room table with some pictures of my parents scattered about (Sucker!) The following Sunday, the weekend before his party, I had him help my husband clean out the garage AND drape the workbenches and such with black sheeting (insert diabolical laughter). 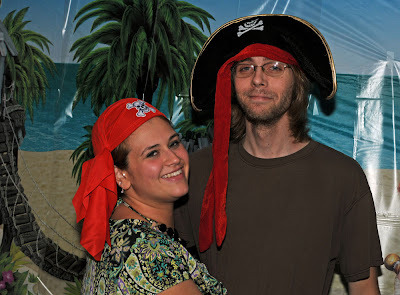 My daughter suggested we go with a pirate theme since he’s been involved with the online Pirates of the Burning Sea game for the past several years. Once that was decided the plotting commenced. 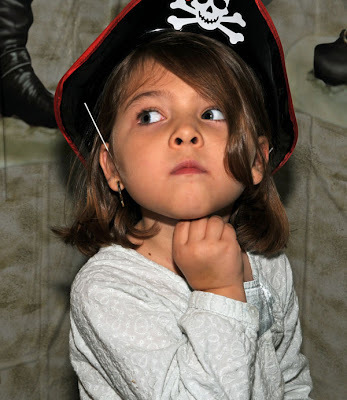 Crabcrotch Carloine…She be sailin’ an Itchy Vessel. All in all the party was a huge success and I think he was happy. Now, a pictorial….minus the fantabulous decorations. Here’s me hugging my son. Yes, he’s towering over me; I’m 5’2” and he’s 6’4”. I don’t where he got his height from but it’s been nice when I’ve needed something out of the cabinet above the refrigerator. 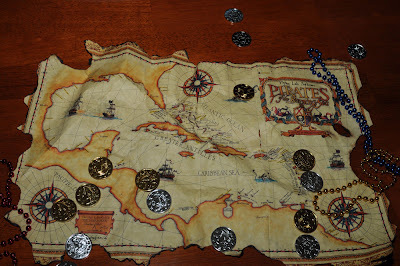 This is the map I found in a box of his books that I burned and crumpled to make look more aged…a map that I was unaware of him wanting to keep (oops!). 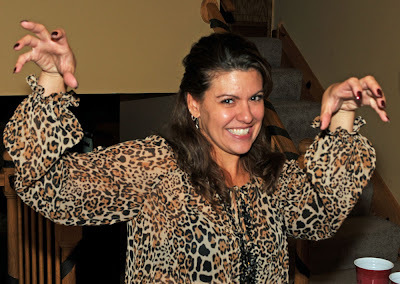 My sister-in-law, who was apparently under the misconception that it was a Jungle Party…RAWR!!! 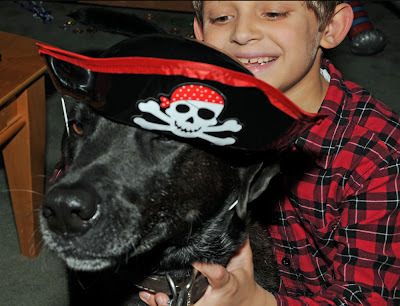 My dog Levi, who got in on the action by threat of walking the plank. That or he would be barred from scavenging any food that was dropped. My son and his girlfriend. He’s truly found his treasure with her. 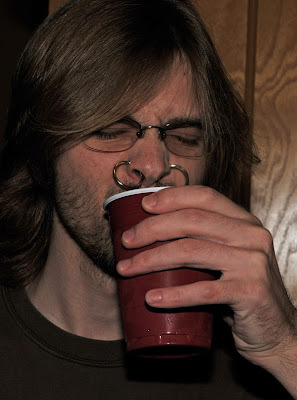 A ring in the ear is worth two in the nose…obviously. 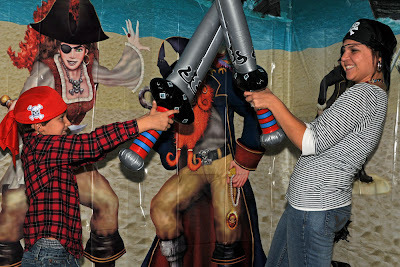 Ahoy maties, make a wish and blow! Happy Birthday to you, my son. You are an intelligent and compassionate young man and I am proud to be your mother. And a Happy Birthday to my grandson who turns eight today. How weird is it that they were both born on the same day…at the same hospital…and are both left handed? What a beautiful family you have. You really went all out for this party. Congratulations on pulling off a nice surprise for your son. Did you not know that ALL of us smart, good looking and somewhat vain people are left handed? Happy Birthday - to your son and to your grandson. Wow! It sounds like it was a blast. My husband is 6'4" and everyone else in his family is so short. If he didn't look so much like them in the face, I'd think there was a mixup at the hospital. 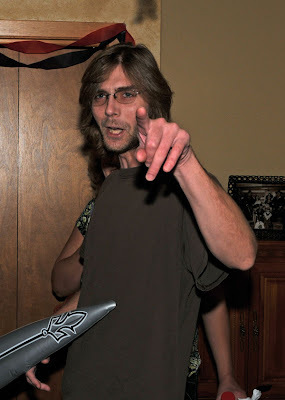 Oh and my dad and his brother were born on the same day, exactly one year apart. I think it's neat. Happy Birthday to the both of them! Looks like you guys had a blast. yea! Happy birthday to them both. Great pictures...what a wonderful thing you did and VERY clever ruses for the birthday boy! happy birthday to your son and your grandson!!! Looks like such a fun time! And you are not old! If you are, I are, and I don't wanna be. Left hander's are pretty cool people. You are 2 years younger than me and I have a 15 year old. You are a youngster! When my son turns 30, not only will I feel old - I will be hold! What a great party. You son certainly doesn't look 30! Hehehe! Mary Jane and Crabcrotch Caroline? Now, that's funny!!!! Looks like a great party with your beautiful family. Oh, and when my kid is 30, I'll be 65 ;0 Sad, I know. Looks like you had an awesome time! And YOU ARE NOT OLD! That looked like such fun. Whenever I read a post about your family I am struck by how wonderful they all are. Wishing your son a very HAPPY (belated) BIRTHDAY! !